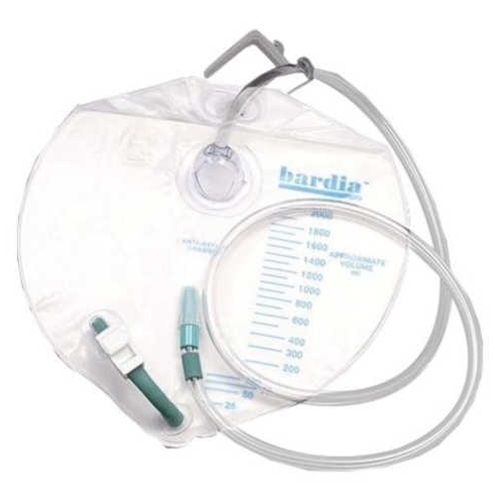 Bardia Drainage Bag with Hanger from HealthyKin.com features a swivel hanger or flexible Velcro cloth strap which facilitates attachment to a bed frame or wheelchair. We have used these for quite awhile & like them much better than the comparable Medline bags. However, I think HK got a defective lot. The bottom seam of 4 of the last 10 bags I've bought have sprung leaks within 5 to 8 days. This is obviously a manufacturing problem, but I am not going to return used bags to prove a point. Excellent product, which I have used before. Top marks to Healthykin.com as well! The price of this item is incredible and shipping was very fast. This is my first purchase with this retailer, but it certainly won't be the last! The type I prefer. Very quick delivery. Great product for the price...thank you . Works well with me and my situations. Fair price. Really fast delivery. Just what I've been looking for. I loved these. Been using them for my husband for years. I recommended them. No leaks and easy to use. We like this product and the price. We did get one that must of had a bad seam and leaked, but only happened once. I am very satisfied with this product, that is why I am a repeated customer!